Chris Hedges gave this speech Saturday at the Sauk County Fairgrounds in Baraboo, Wis., before a crowd of about 2,000. His address followed one there by U.S. Sen. Bernie Sanders, a Vermont independent who seems to be preparing to run in the Democratic presidential primaries. The Fighting Bob Fest, the annual event at which they appeared, brings together progressive speakers from around the country and honors Robert “Fighting Bob” La Follette (1855-1925), a U.S. senator from Wisconsin who opposed the United States’ entry into World War I. Parts of this talk were drawn from Hedges’ past columns. I would like to begin by speaking about the people of Gaza. Their suffering is not an abstraction to me. I was the Middle East bureau chief for The New York Times. I spent seven years in the region. I speak Arabic. And for much of that time I was in Gaza, including when Israeli fighter jets and soldiers were attacking it. I have stood over the bodies, including the bodies of children, left behind by Israeli airstrikes and assaults. I have watched mothers and fathers cradle their dead and bloodied boys and girls in their arms, convulsed by an indescribable grief, shrieking in pitiful cries to an indifferent universe. The refusal to speak out for the people of Gaza is not tangential to our political life. The pathetic, Stalinist-like plebiscite in the [U.S.] Senate, where all 100 senators trotted out like AIPACwindup dolls to cheer on the Israeli bombing of homes, apartment blocks, schools—where hundreds of terrified families were taking shelter—water treatment plants, power stations, hospitals, and of course boys playing soccer on a beach, exposes the surrender of our political class to cash-rich lobbying groups and corporate power. 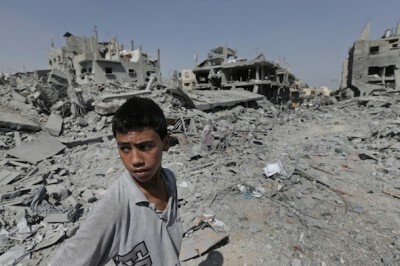 The people of Gaza are expendable. They are poor. They are powerless. And they have no money. Just like the poor people of color in this country whose bodies, locked in cages, enrich the prison-industrial complex. When you are willing to sacrifice the most vulnerable for political expediency it becomes easy, as Barack Obama and the Democratic Party have amply illustrated, to sacrifice all who are vulnerable—our own poor, workers, the sick, the elderly, students and our middle class. This is a Faustian compact. It ends by selling your soul to Goldman Sachs and ExxonMobil. It ends by deifying a military machine, now largely beyond civilian control, that, along with our organs of state security, has established surveillance and a security state that make us the most spied-upon, eavesdropped, monitored and photographed populace in human history. It is impossible to describe yourself as free when you are constantly watched. This is the relationship of a master and a slave. The squabbles among the power elites, rampant militarism and the disease of imperialism, along with a mindless nationalism that characterizes all public debate, which Bob La Follette denounced and fought, have turned officially sanctioned politics into a carnival act. Pundits and news celebrities on the airwaves engage in fevered speculation about whether the wife of a former president will run for office—and this after the mediocre son of another president spent eight years in the White House. This is not politics. It is gossip. Opinion polls, the staple of what serves as political reporting, are not politics. They are forms of social control. The use of billions of dollars to fund election campaigns and pay lobbyists to author legislation is not politics. It is legalized bribery. The insistence that austerity and economic rationality, rather than the welfare of the citizenry, be the primary concerns of the government is not politics. It is the death of civic virtue. The government’s system of wholesale surveillance and the militarization of police forces, along with the psychosis of permanent war and state-orchestrated fear of terrorism, are not politics. They are about eradicating civil liberties and justifying endless war and state violence. The chatter about death panels, abortion, gay rights, guns and undocumented children crossing the border is not politics. It is manipulation by the power elites of emotion, hate and fear to divert us from seeing our own powerlessness. As long as most citizens believe in the ideas that justify global capitalism, the private and state institutions that serve our corporate masters are unassailable. When these ideas are shattered, the institutions that buttress the ruling class deflate and collapse. The battle of ideas is percolating below the surface. It is a battle the corporate state is steadily losing. An increasing number of Americans are getting it. They know that we have been stripped of political power. They recognize that we have been shorn of our most basic and cherished civil liberties. They know that nearly half the country lives in poverty or a category called “near poverty.” Many of the rest of us, if the corporate state is not overthrown, will join them. These truths are harder and harder to hide. It appears that political ferment is dormant in the United States. This is incorrect. The ideas that sustain the corporate state are swiftly losing their efficacy across the political spectrum. The ideas that are rising to take their place, however, are inchoate. The right has retreated into Christian fascism and a celebration of the gun culture. The left, knocked off balance by decades of fierce state repression in the name of anti-communism, has yet to rebuild itself and turn on a feckless liberal class that has sold its soul to a bankrupt Democratic Party. The tinder of revolt is piling up. No person or movement can ignite this tinder. No one knows when the eruption will take place. No one knows what form it will take. But it is certain that a popular revolt is coming. The refusal by the corporate state to address even the minimal grievances of the citizenry, the continued pillaging of the nation and the ecosystem, remind us that, as Karl Marx pointed out, unregulated, unfettered capitalism is a revolutionary force. It commodifies everything. Human beings and the natural world become commodities that are exploited until exhaustion or collapse. This is why the economic crisis is intimately twined with the environmental crisis. The corporate state—a system described by the political philosopherSheldon Wolinas “inverted totalitarianism”—is incapable of a rational response to the crisis. A rational response, especially after your uprising in Madisonand the Occupy movement, would at a minimum include a moratorium on all foreclosures and bank repossessions, a forgiveness of student debt, universal health care for all and a massive jobs program, especially targeted at those under the age of 25. But the corporate state, by mounting a coordinated federal effort led by Barack Obama to shut down the Occupy encampments, illustrated that the only language it will speak is the language of force. Revolutions, when they erupt, appear to the elites and the establishment to be sudden and unexpected. This is because the real work of revolutionary ferment and consciousness is unseen by the mainstream society, noticed only after it has largely been completed. Throughout history, those who have sought radical change have always had to first discredit the ideas used to prop up ruling elites and construct alternative ideas for society, which [today] means the articulation of a viable socialism as an alternative to corporate tyranny. This is where we are headed. I do not say this because I am a supporter of revolution. I am not. I prefer the piecemeal and incremental reforms of a functioning democracy. I prefer a system in which our social institutions permit the citizenry to nonviolently dismiss those in authority. I prefer a system in which institutions are independent and not captive to corporate power. But we do not live in such a system. Revolt is the only option left. Ruling elites, once the ideas that justify their existence are dead, resort to force. It is their final clutch at power. If a nonviolent popular movement is able to ideologically disarm the bureaucrats, civil servants and police—to get them, in essence, to defect—nonviolent revolution is possible. But if the state can organize effective and prolonged violence against dissent, it spawns reactive revolutionary violence, or what the state calls terrorism. And our backlash, if we on the left do not regain the militancy of the old anarchists and socialists, could be a right-wing backlash, a species of Christian fascism. The people in Gaza deserve to be free. So do we. But do not look to our political mandarins for help, or expect anything but vaudevillian smoke and mirrors from the billions poured into our campaign circus. We too are powerless. We have undergone a corporate coup d’état in slow motion. It is over. They have won. If we want to wrest power back, to make the consent of the governed more than an empty cliché, we will have to mobilize, to carry out sustained acts of civil disobedience to overthrow—let me repeat that word for the members of Homeland Security who may be visiting us this afternoon—overthrow the corporate state. And maybe, once we have freed ourselves, we can free the people of Gaza.